Located just off U.S. Highway 24, immediately inside the east entrance to the Park, the Visitor’s Center was originally built in 1969. Over the years, it fell into disrepair and was closed. In 2018, having secured a grant from the Solomon Valley Community Foundation, the Waconda Cultural Committee, G.E Park staff and several locals joined to create a plan to renovate and add an educational opportunity inside the building. ​A small museum, visitors will enjoy reading historical information from large educational panels, and viewing artifacts relevant to the Waconda Lake area. The panels provide information about the geological history of the Solomon River Valley, Waconda Springs, Native Americans and the building of Waconda Dam for flood control. As well, an eleven foot mural of the Waconda Springs Legend, displayed in the original visitor’s center, is featured. 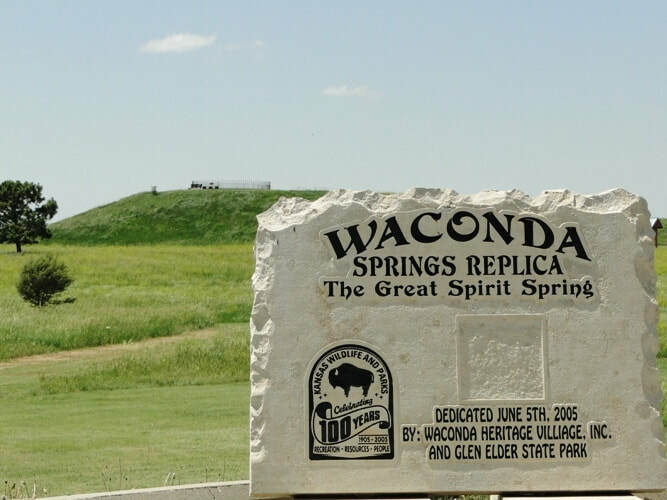 Dedicated on June 5, 2005, the replica of Waconda Springs is located less than a quarter mile from the park's Ranger Station just south of U.S. Hwy 24 on KS Hwy 128. ​Waconda Lake's namesake is based on the famous Great Spirit Spring... Waconda Springs, and the legend of an Indian princess who died at the location. The spring, now covered by the lake, was located near midway between Glen Elder and Cawker City, Kansas. The creation of the Waconda Springs replica was endeavored by Waconda Heritage Village, Inc., and Glen Elder State Park. The replica is positioned to provide an inspiring 360º view of Waconda Lake, the park and the surrounding area. 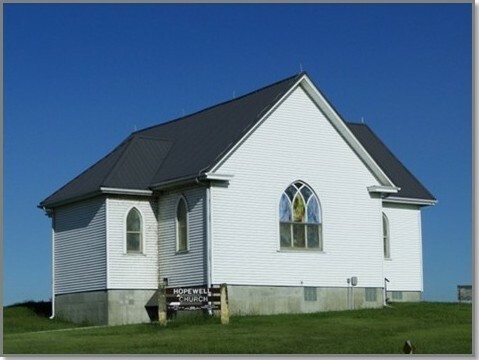 Waconda Heritage Village, Inc., took interest in the historic Hopewell Church in 1991 when the building was slated for demolition. Now sitting, just a half-mile north of the shores of Waconda Lake, just south of the Glen Elder State Park Ranger Station, Hopewell stands revived. The church, moved 15 miles to its present location in 1994 from it's original location southwest Beloit, represents the first stage of the Waconda Heritage Village Association's goal of creating a "living" site dedicated to pioneer heritage and Native American lore. The names "Leslie" and "Hopewell" are the thread that holds the story together as the scene shifts to Illinois. Samuel and Harriet Leslie left the Hopewell church in Ohio to make their home in Henderson County, Illinois.